Renderings courtesy of the BSO. The Boston Symphony Orchestra announces a major new investment in the future of Tanglewood that will broaden its reputation as one of the premier festivals in the world and famed summer home of the BSO since 1937, as well as that of its acclaimed summer music academy, the Tanglewood Music Center, founded in 1940. Launching a new chapter in the illustrious festival’s 80-year history, Tanglewood has announced plans for the construction of a new multi-use, multi-season four-building complex designed to support the performance and rehearsal activities of the Tanglewood Music Center and be the focal point of a new initiative, the Tanglewood Learning Institute, offering wide-ranging education and enrichment programs designed to enhance the patron experience. Scheduled to open in summer 2019, the new building complex will be designed by William Rawn Associates, Architects, led by William Rawn and Cliff Gayley, and will be the largest building project at Tanglewood since the construction of Ozawa Hall (1994), also designed by William Rawn Associates. Reed Hilderbrand will serve as the project’s landscape architects. An announcement with details about the official ground-breaking ceremony for the new building project, to take place late summer 2017, will be distributed during the upcoming 2017 Tanglewood season. This $30 million building project is part of a multi-year fundraising effort to support ongoing Tanglewood building upgrades and horticultural renewal programs, providing enhanced experiences for current and future generations of concertgoers and performing artists. This fundraising effort will also include a special endowment for the BSO’s concert activities and other Tanglewood programming. Further details of this fundraising effort will be announced at the end of the 2017 Tanglewood season. One of the premier summer music festivals in the world and summer home of the Boston Symphony Orchestra since 1937, Tanglewood is located in the beautiful Berkshire Hills, between Stockbridge and Lenox, Massachusetts. The Tanglewood Music Center is the Boston Symphony Orchestra’s acclaimed summer music academy; Serge Koussevitzy (BSO Music Director 1925-49) founded the festival in 1937 and opened the TMC in 1940. For a complete history of the buildings on the Tanglewood grounds click here. “As stewards of one of the world’s most beloved summer music festivals and one of the top summer music academies for young musicians embarking on professional careers, all of us at the BSO feel a tremendous obligation to continue advancing Tanglewood’s highest performance and education aspirations," Mark Volpe said. "We also welcome our role as caretakers of Tanglewood’s exquisite beauty—an inspiration for the millions of concertgoers who have played an essential role in sustaining the festival since its founding in 1937. To that end, we are thrilled to announce plans for a new four-building complex—one of the biggest building and landscaping investments at Tanglewood since Ozawa Hall opened in 1994. 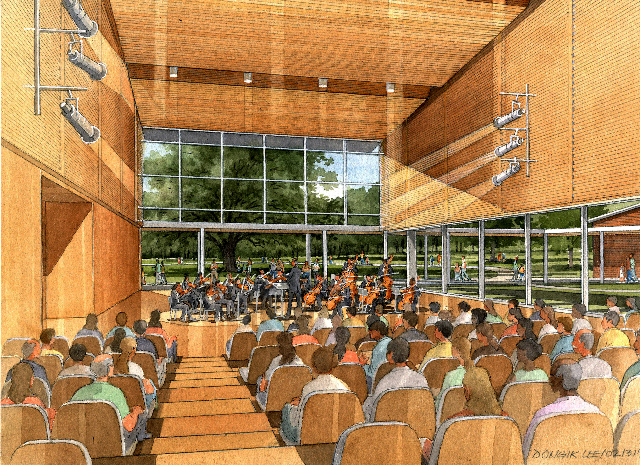 “Tanglewood’s new building complex represents a major milestone for the BSO as it furthers its commitment to the Tanglewood Music Center by providing a new state-of-the-art facility to match the extraordinary level of talent exhibited by the Fellows each summer. In addition, the Tanglewood Learning Institute will introduce an exciting new venture by offering patrons an entirely new paradigm of education and enrichment programs, sure to expand the reach of the festival and bring welcome newcomers to the BSO’s famed summer home. “My first experience at Tanglewood in the summer of 2012 marked the beginning of a deep appreciation for the many exceptional qualities of Tanglewood that make it an absolutely unique experience in the world of summer music festivals." Andris Nelsons said. "The great BSO Music Director Serge Koussevitzky had tremendous foresight in recognizing the potential of Tanglewood as a beacon of inspiration for all those visiting and experiencing its many gifts, so our investment in its future is essential as we continue to expand Tanglewood’s many wonderful offerings. “Tanglewood’s new building project will provide the best possible atmosphere for the talented Fellows of the Tanglewood Music Center to learn and grow on their path to becoming the next generation of musicians, earning their spots in the world’s great orchestras, concert halls, and opera houses. The new Tanglewood Learning Institute starts a new chapter in the orchestra’s remarkable history by connecting our audience to our music-making in new ways and expanding Tanglewood’s reach by welcoming new visitors experiencing the festival’s profound and extraordinary musical gifts. In summer 2019, Tanglewood will celebrate the opening of a major new multi-use, multi-season four-building complex to support the performance and rehearsal activities of the Tanglewood Music Center (TMC), the orchestra’s acclaimed summer music academy for advanced musical study; it will be the largest building project on the Tanglewood grounds since the construction of Ozawa Hall in 1994. This new facility—including a 200-seat concert space—will enhance, support, and streamline TMC activities to assure that it continues to attract the most competitive class of Fellows, as well as a stellar faculty, including many of today’s most prestigious composers, performers, and conductors. This new building complex will provide significantly more rehearsal and performance space, creating optimal conditions for the activities of the TMC Fellows and ensuring that the facilities match the world-class level of its education program. These new buildings will also serve as the home of the Tanglewood Learning Institute, a program designed to provide the festival’s patrons with a rich array of educational and enrichment experiences that encourage a closer connection between artists and audiences and complement the festival’s traditional schedule of performances, resulting in a more expansive, integrated, and engaged campus. In addition, these new climate-controlled buildings, which can adapt to accommodate groups of various sizes and purposes, will be made available for rental by the Berkshire community for use in the off season. This project has been designed to reflect the Tanglewood experience of beauty and intensity of music-making infused by the surrounding Berkshire landscape and informality of gatherings on the festival’s iconic expansive lawn. Located along the top of the Highwood ridge, overlooking the Ozawa Lawn and more distant views of the Berkshire Hills, this ensemble of four buildings gathers around a 100-foot tall Red Oak, with a sinuous covered walkway connecting each building and framing views and paths through the landscape. At the heart of the four-building project, Studio 1 (77 ft x 52 ft) represents a uniquely Tanglewood approach to music – excellent acoustics and open to the landscape. A full wall of glass (30 feet high and 50 feet wide) allows the large Red Oak and landscape beyond to serve as a backdrop to the stage. A 50 foot wide (10 foot high) retractable glass wall can open directly out to the porch and the surroundings, recalling Ozawa Hall’s 50 foot “barn door,” which opens Ozawa Hall to its lawn. As the largest of the three studios, Studio 1 is equipped with technologies that maximize its flexibility for performance, rehearsal, and educational offerings of the Tanglewood Learning Institute. Retractable seating that is both cutting- edge and comfortable allows the room to transform from flat floor to raked seating; when retracted, the flat floor is slightly larger than the stage of Ozawa Hall (35 ft x 55 ft). Variable acoustic elements allow this tall volume space to be “tuned” to support a range of events, including recital, chamber music, and chamber orchestra performances with an audience of 200; performances by larger ensembles with an audience of 100; rehearsals for a full orchestra as well as large ensembles; lectures for an audience of 300; or social and dining events. Robust audio-visual technology will support recording and distance learning, giving the content created in this space a global presence. Studios 2 (45 ft x 37 ft) and 3 (35 ft x 27 ft) will support TMC rehearsals and performances, as well as TLI events. As rehearsal and performance space for small and medium ensembles, Studio 2 can accommodate audiences of 60 and Studio 3 can accommodate 40. 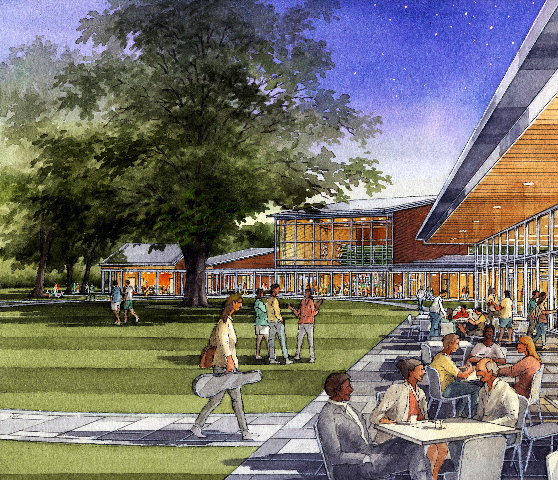 The Café (107 ft x 30 ft), with 150 seats, has been designed to become a center of gravity for everyone at Tanglewood, an informal place for musicians and audience members to interact—a hub for visitors, TMC Fellows and Faculty, and TLI participants. The four buildings—Tanglewood’s first year-round structures with both heating and air conditioning— embody a strong commitment to environmental stewardship. Natural ventilation and abundant day lighting in all the main spaces are designed to minimize energy use during the busy summer season. Other notable sustainable features include rainwater harvesting for irrigation; high-efficiency mechanical systems with low-velocity ductwork, meeting acoustic requirements; highly efficient LED theatrical lighting; water-saving plumbing fixtures; red cedar cladding harvested from renewable sources; and recyclable zinc roofing. In addition to its uses by the TMC and TLI, the new building complex will also benefit the activities of the Boston Symphony Orchestra, including providing needed rehearsal space for the Tanglewood Festival Chorus, among other BSO-related rehearsal and concert activities. The Tanglewood Learning Institute will offer patrons several new and distinctive education and enrichment offerings. Though still in the development phase, the Tanglewood Learning Institute will offer a variety of learning and appreciation programs, featuring seminars and panel discussions, film presentations, conversations with artists, and special access to concerts and master classes. A keynote lecture series will spotlight highly sought-after speakers to give presentations on subjects related directly and indirectly to each Tanglewood season. The Tanglewood Learning Institute will also develop a unique and focused set of special offerings attractive to the festival’s local concertgoers, as well as to visitors from across the United States and abroad. This program will include an all-inclusive “passport program,” whereby participants are given access to BSO and TMC closed rehearsals, TMC master classes, and backstage visits with BSO and TMC musicians, guest artists, and conductors, among other activities. The Tanglewood Learning Institute will also have a distance-learning component featuring webcast audio and video of many of the TLI sessions, as well as of select Tanglewood Music Center master classes and rehearsals. Specific details of the first session of the 2019 Tanglewood Learning Institute will be announced in the fall of 2018. Building upon the highly acclaimed success of Ozawa Hall as one of the leading venues of its kind in the country, Tanglewood will make a major investment in upgrading, improving, and enhancing many of the patron amenities in the area surrounding the hall, which draws over 50,000 people annually. Changes will include renovation and relocation of the Ozawa Hall Gate, to better integrate it into the expanded Tanglewood Music Center campus, which will now encompass Ozawa Hall and the new four-building complex. Additional changes will include an upgrade to the Ozawa Hall Gate box office and improved patron amenities, including upgrades to the restroom facilities and food services operation. For many of the Festival’s 350,000 annual visitors, the Tanglewood grounds are just as integral to the overall experience as the music that defines the festival’s 80-year tradition of great performances. As part of the overall major investment in Tanglewood, the BSO will revitalize and strengthen Tanglewood’s bucolic Berkshire landscape, with new plantings, pedestrian circulation improvements, and the restoration of views of the Stockbridge Bowl. Infrastructure changes will include upgrades to improve the efficiency of Tanglewood’s 50-year-old lawn irrigation system, which plays a major role in the upkeep of the festival’s magnificent expanse of lawn. The planting of approximately 144 trees, including 87 new understory trees and 57 canopy trees, will enhance the festival’s beloved scrubland and woodland landscape character while also strengthening Tanglewood’s ecological health. To better manage storm water on the property, Reed Hilderbrand will design extensive new infiltration systems, replacing conventional sewers and drains with treatment soils and plants. Materials specified by Reed Hilderbrand for landscape improvements, most visibly paving stone, are to be sourced from local quarries and manufacturers. For Reed Hilderbrand, construction of the Tanglewood Learning Institute presents opportunities for investment in sustainable infrastructure and stewardship initiatives that strengthen Tanglewood’s place in the Berkshire community. In addition, Tanglewood has established the Horticultural Stewardship Program, a comprehensive new initiative to create and implement uniform strategies for documenting, maintaining, preserving, and enhancing Tanglewood’s horticultural assets. Initial program components include new software for data collection, record keeping, and mapping existing plantings on campus. Future plans include a systematic blueprint for plant care and landscape management, as well as a public education program for patrons interested in knowing more about the plant landscape of Tanglewood. In addition to the new programs outlined in this press release, visitors to Tanglewood will have many opportunities to enjoy the treasured traditions of the festival, including weekly concerts with the Boston Symphony Orchestra and performances by the Boston Pops and Tanglewood Music Center orchestras; a lineup of extraordinary BSO guest artists, featuring some of the world’s most cherished musicians widely known to Tanglewood audiences, as well as new talents making their first appearances at the festival; chamber music and recital programs spotlighting today’s most sought-after artists in the intimate atmosphere of Ozawa Hall; weekly performances by the young Fellows of the Tanglewood Music Center, including the annual Festival of Contemporary Music; and a Popular Artist series sure to inspire music fans near and far to come hear their favorite musicians perform at the iconic festival. In addition, Tanglewood continues to offer many free and discounted ticket and educational programs, including free tickets for patrons 17 and younger, as well as a wide variety of cafe and fine dining options, and free tours of Tanglewood’s expansive grounds and famous performance spaces. For a complete history of Tanglewood, click here. Tanglewood—one of the premier summer music festivals in the world and summer home of the Boston Symphony Orchestra since 1937—is located in the beautiful Berkshire Hills, between Stockbridge and Lenox, Massachusetts, over an expanse of grounds covering 524 acres, with approximately 100 buildings of various sizes and architecture on the Tanglewood property. The main campus comprises 330 acres, including the 210-acre William Aspinwall Tappan estate, the original property donated to the orchestra in 1937 by family descendants Mrs. Gorham Brooks and Mary Aspinwall Tappan, and the property where the Koussevitzky Shed is located. In 1986, the BSO purchased Highwood, the adjoining 120-acre former estate of Samuel Gray Ward, from Mr. and Mrs. John Mason. It is the location of the Bernstein campus and Ozawa Hall (opened in 1994), the focal point of the activities of the TMC, and the future location of Tanglewood’s new four-building complex. In 1979, the BSO purchased Seranak, the 170-acre former estate of Serge Koussevitzky (BSO Music Director, 1924-1949), located on Richmond Mountain Road about one mile from the entrance to the Tanglewood grounds; it serves as a residence for TMC faculty, guest artists, and Tanglewood guides, as well as a facility for special events and a supper club for donors. Filling out the remaining acreage are parking lot areas and two smaller properties used to house staff and TMC Fellows and faculty. For a chronology of Tanglewood’s buildings, click here. Founded in 1940 by Serge Koussevitzky (BSO Music Director, 1924-49), the Tanglewood Music Center is a world-renowned summer institute created to further the tradition of classical music and serve as an American center for advanced musical study for young professional instrumentalists, singers, composers, and conductors who have completed the majority of their formal training. Considered the premier program of its kind in the country and around the world, the TMC is the only music academy that is a core activity of a major symphony orchestra, with the membership of that orchestra playing a key role in preparing Fellows for a future life in music. More than half the members of the Boston Symphony Orchestra teach at the TMC each summer; in addition to BSO member participation, the full-time faculty comprises highly accomplished musicians, and is further enriched by preeminent guest artists and conductors who work with the TMC in conjunction with their appearances at Tanglewood with the BSO or in other major performance capacities in the festival’s concert schedule. Admission to the TMC is highly competitive, with approximately 1,500 musicians competing annually for roughly 100 positions. Those accepted into the program receive fellowships that cover tuition, room, and board. Since its founding, the TMC has had a profound impact on the field of music and the quality of musicianship in the United States, with many TMC alumni among the most recognized and influential composers, conductors, and soloists of their time. Over the past 76 years, more than 10,000 musicians have passed through the prestigious music academy. According to the most recent available estimates, 20 percent of the members of American symphony orchestras, and 30 percent of all first-chair players, studied at the Tanglewood Music Center. Prominent alumni of the TMC include BSO Music Director Laureate Seiji Ozawa, Claudio Abbado, Jamie Barton, Luciano Berio, Leonard Bernstein, William Bolcom, Sarah Caldwell, Phyllis Curtin, David Del Tredici, Christoph von Dohnányi, Charles Dutoit, Jacob Druckman, Lukas Foss, Michael Gandolfi, Osvaldo Golijov, John Harbison, Oliver Knussen, Lorin Maazel, Wynton Marsalis, Zubin Mehta, Sherrill Milnes, Ludovic Morlot, Leontyne Price, Ned Rorem, Bright Sheng, Cheryl Studer, Sanford Sylvan, Augusta Read Thomas, Michael Tilson Thomas, Dawn Upshaw, Shirley Verrett, and David Zinman. From its first season in 1940, Serge Koussevitzky set a precedent of bringing the leading musicians of the time to teach at the Tanglewood Music Center, with Aaron Copland as the first Director of the School, and Gregor Piatagorsky, Boris Goldovsky, and Paul Hindemith among the prestigious faculty in the early years of the academy, and Leonard Bernstein, Lukas Foss, and Sarah Caldwell among its first students. Since that time, the list of musicians who have served on the TMC faculty or in a significant teaching capacity has included such luminaries of the classical music field as Emanuel Ax, Stephanie Blythe, Elliott Carter, Phyllis Curtin, Luigi Dallapiccola, Jacob Druckman, Lukas Foss, Michael Gandolfi, Osvaldo Golijov, John Harbison, Hans Werner Henze, Oliver Knussen, Yo-Yo Ma, Sanford Sylvan, Gunther Schuller, Peter Serkin, and Dawn Upshaw, among others. Many of the world’s most prestigious conductors, including Claudio Abbado, Leonard Bernstein, Christoph von Dohnányi, Charles Dutoit, Erich Leinsdorf, James Levine, Charles Munch, Andris Nelsons, Seiji Ozawa, and William Steinberg, have led TMC Orchestra concerts and worked with TMC Conducting Fellows. In addition to high-profile orchestral performances, the Tanglewood Music Center Fellows participate in opera and music theater projects, chamber music and vocal recital programs, and master classes and coaching sessions led by some of the preeminent artists of our time. The Tanglewood Music Center (originally called the Berkshire Music Center) also offers fellowships for orchestral librarians. In recent years, the Tanglewood Music Center has taken measures to share its activities with audiences and students beyond the confines of the Tanglewood campus through new media outlets. Several of these programs are featured on the BSO’s website, bso.org (also accessible through tanglewood.org), the largest and most-visited orchestral website in the country, receiving approximately 7 million visitors annually. In 2015, as part of the Tanglewood Music Center’s 75th anniversary, the TMC offered free weekly downloads at www.tanglewood.org featuring some of the most iconic recordings from its archives. The weekly releases focused on great orchestra programs led by former BSO music directors including Serge Koussevitzky, Erich Leinsdorf, James Levine, and Seiji Ozawa; such distinguished alumni as Leonard Bernstein; and current BSO Music Director Andris Nelsons. The releases also featured some of the most memorable and significant TMC performances of new music, chamber music, and vocal music. These recordings were part of a larger effort to digitize the TMC’s complete library of recorded works, ensuring that this impressive historic collection is preserved and made available for current and future generations of musicologists and music lovers. Also during 2015, a special webcast of the Tanglewood Music Center 75th Anniversary Gala performance of Mahler’s Symphony No. 8, “Symphony of a Thousand,” led by BSO Music Director Andris Nelsons, was made available for on-demand viewing on Tanglewood.org, bringing the TMC’s anniversary celebration to viewers around the world. Boston’s Copley Square also hosted a free live screening of the concert, which was broadcast on a 16-foot screen. In summer/fall 2014 the Tanglewood Music Center was featured in “New Tanglewood Tales: Backstage with Rising Artists,” a behind-the-scenes web documentary chronicling the lives of six young musicians during their summer as TMC Fellows; the seven-episode series received more than 425,000 views since first appearing in July 2014, and was later featured on select PBS stations across the country. A second season of New Tanglewood Tales, “New Tanglewood Tales: Life On Stage and Off,” followed the behind-the-scenes experience of five BSO musicians and an assistant conductor through their 2015 Tanglewood summer, rehearsing for concerts and working with TMC Fellows. In summer 2013, the TMC’s recording of the U.S premiere performance of George Benjamin’s opera Written On Skin received a webcast premiere on New York’s Q2 Music (q2music.org), WQXR’s online music station devoted to new music; the performance was archived for on-demand listening for six months following the webcast. In 2012, as part of the celebration of the Tanglewood Festival’s 75th anniversary season, the BSO released two streaming master classes—one led by BSO concertmaster Malcolm Lowe, and another led by BSO principal trumpet Thomas Rolfs and second trumpet Benjamin Wright—providing viewers an inside look into the dynamic teaching process between BSO musicians and the Fellows of the Tanglewood Music Center. These classes, shot in documentary-like style in order not to disturb the teaching process, offered music students around the country and across the globe an opportunity to observe the interaction between the BSO musicians and their young TMC counterparts that epitomizes the teaching method at the Center. Also as part of the Tanglewood Festival’s 75th anniversary in 2012, several Tanglewood Music Center Orchestra performances were featured during the release of 75 free digital streams (one for each day of the summer) designed to offer music lovers worldwide a glimpse into the storied performance history of the famed music festival founded in 1937, and its acclaimed music academy; the project resulted in more than 420,000 streams and downloads. The TMC’s most recent traditional media project featured the Tanglewood Music Center Orchestra sharing the stage with the Boston Symphony and Boston Pops orchestras for a performance with musical luminaries Emanuel Ax, Yo-Yo Ma, Anne-Sophie Mutter, and Andris Nelsons for the Festival’s 75th Anniversary Celebration, taped for broadcast on PBS’s “Great Performances,” telecast nationally, and released on Blu-ray and DVD. Throughout the summer, WCRB Boston, a service of WGBH, produces and broadcasts Tanglewood concerts from the Shed, which can be heard on WCRB 99.5FM in Boston and WJMF 88.7FM in Providence; WAMC 90.3FM in Albany; and WMNR 88.1FM in Connecticut. In addition, Sunday-afternoon concerts are broadcast on WFCR 88.5FM in Amherst, WCNH 91.5 in Concord, NH, and on the classical music stations of Vermont Public Radio and Maine Public Broadcasting Network. Streams of these broadcasts can be accessed via the station’s websites at classicalwcrb.org; wamc.org; wmnr.org; nepr.net; nhpr.org; vpr.net; and mpbn.net. In partnership with WCRB, on-demand audio of the broadcasts is made available on WCRB’s website and on the BSO website’s Media Center (bso.org/mediacenter) in the days following performances and for up to a year after the original date. Likewise, visitors to WCRB’s website can enjoy the “BSO Concert Channel,” which provides a continuous high-quality audio stream of live BSO performances from Symphony Hall and Tanglewood.